Salvador Dali is arguably one of the most famous artists in the world, and certainly one of the most famous artists of the Surrealist movement. Famous for his gorgeously complex, detailed and - obviously - surreal paintings, his ridiculous upturned moustache and the parties that he hosted/attended, it may come as a complete surprise that he once wrote a cookbook. "We would like to state clearly that, beginning with the very first recipes, Les Diners de Gala, with its precepts and its illustrations, is uniquely devoted to the pleasures of Taste. Don’t look for dietetic formulas here. We intend to ignore those charts and tables in which chemistry takes the place of gastronomy. If you are a disciple of one of those calorie-counters who turn the joys of eating into a form of punishment, close this book at once; it is too lively, too aggressive, and far too impertinent for you." Apparently, Dali wanted to be chef when he was a child, before falling in love with the arts. This love of food is visible throughout a large number of his pieces - who, after all, could forget the lobster telephone? Later in life, he became famous for his exquisite dinner parties, with some of the world's most famous chefs preparing the meals. 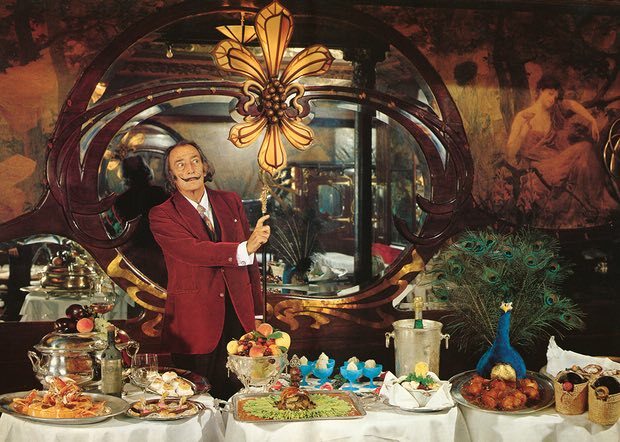 Guests were all required to wear incredibly elaborate costumes in order to be let in the door, and wild animals like Dali's pet ocelot Babou would wander freely around the table. "I only like to eat what has a clear and intelligible form. If I hate that detestable degrading vegetable called spinach it is because it is shapeless, like Liberty. I attribute capital esthetic and moral values to food in general, and to spinach in particular. The opposite of shapeless spinach, is armor. I love eating suits of arms, in fact I love all shell fish… food that only a battle to peel makes it vulnerable to the conquest of our palate." We hope you're confusing and delighting the hell out of everyone wherever you are now, Senor Dali.